This post was inspired by Mika Epstein’s WordCamp Europe talk on June 24, 2016. One star. Five stars. Either way, reviews involve judgement and affirmation. You can’t escape that. So, how do we deal with them? Of course, here at Impress.org, we sell a plugin that allows you, as a business, to display reviews from Google, Facebook, Yelp, and Yellow Pages directly on your WordPress site. Reviews are social proof and to a business they’re valuable as part a part of their marketing plans. As humans, we prefer to be accepted, loved, and affirmed. Online, this often occurs with a review. This is especially true of the creative person. We put our heart and soul into our writing, code, and photography. No matter the craft or trade, creativity is intrinsically tied to our identity. And our identity is often protected — carefully. Think about it. Why are there talks and books on the power of vulnerability? No one wants to expose themselves as possibly flawed. Yet, we are, in fact, fallible. Perfection is the thing we chase in order to achieve worthiness. But worthiness doesn’t derive from perfection — it derives from acceptance. And if you consider this a bit more, why would acceptance be so important except we know it involves unconditional love? It’s unconditional because we are flawed. We do make mistakes. We are human. Many of our plugins, including Give which has over 100 five-star reviews, are available for free on the WordPress repository. With the listing comes support and reviews. This can both help people choose us and act as social proof as well — just like any other business. There are one-star reviews and troll reviews and blackmail reviews and pat-on-the-back reviews and even genuine reviews. It’s hard to sort them all. 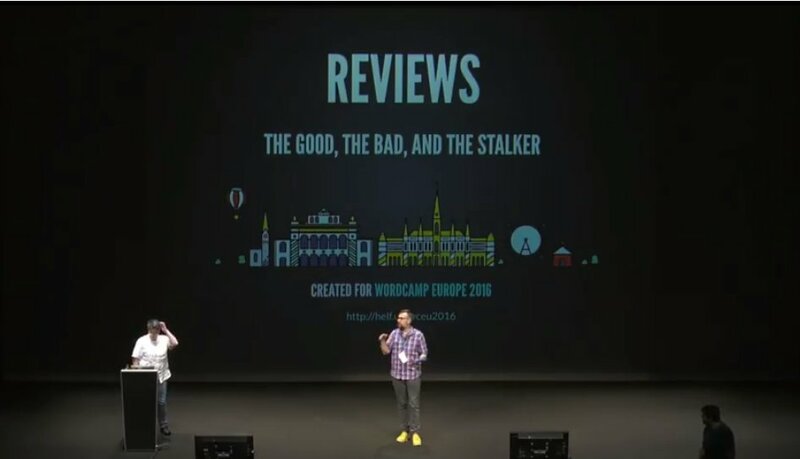 At WordCamp Europe, Mika Epstein gave a great talk about how to handle reviews — both good and bad. But her main point was that reviews should be a tool to learn from. Mika started out her talk with a cautionary tale of a person who overly internalized a one-star review on Amazon. He literally stalked the reviewer and was sentenced to only 30 months in jail. Your identity is not your review. Your code is not your identity. There is no review so bad that it deserves that much of your time or energy. You know the saying, “Code is poetry.” This means that nuance and style and personality are involved. You cannot please everyone. Function? Yes. But not every code will be naturally intuitive. It’s an impossible dream. Again, a one-star review’s power comes from whether or not we believe it’s affected our identity. Recently, Matt Cromwell wrote about WordPress Reviews in Real Life. The reason why it’s “sadly hilarious” as Matt points out, is because every theme and plugin author can relate. There are so many expectations put upon code that have nothing to do with us. If you’re not learning, you’re not growing either professionally or personally. Take the review. Look at it objectively. When I was younger, my husband gave me a piece of actionable advice when it came to criticism. Because I wouldn’t want to be even ten percent of what someone said that truly hurt my feelings, I have learned to be introspective. It’s hard to look in the mirror sometimes. Well, most of the time. But if you’re courageous, you’ll be better because of it. Mika actually suggests that the most valuable reviews are the four-star reviews. These reviews are fair and honest. They say you did a good job but could also improve by doing x. Take these reviews to your development team or next product meeting. See how you can improve. Should you choose to engage with the public, you will be dealing with passive-aggressive comments, displaced anger, blame, and things that do and do not have to do directly with your product. Snark will happen. Mika recommends that you respond politely, ask questions, and be apologetic within reason. And the thing to remember is why you wrote the plugin or theme in the first place. Why did you put this code in the repository? Is it for you or your audience? Is it to boost your own ego or to help promote WordPress, Open Source, and Democratized Publishing? By the way, you can see Mika’s slides here.